What Is the Magic Move in a Golf Swing? There are many elements to a successful swing. No subject is more often discussed, and more frequently misrepresented, than the Holy Grail of pure ball-striking, golf's "Magic Move." You might think that a fundamental swing technique so critical to golfing success would be an undisputed fact, but it is not. Together, we will find the real Magic Move and learn to implement it, beginning your journey to a better swing and lower scores. Golf legends like Sam Snead and Ben Hogan mastered the golf swing through years of thankless work in cow pastures, empty lots and on driving ranges, without the assistance of video cameras and slow-motion swing review. As Hogan famously proclaimed, "The secret is in the dirt." Modern golf instruction was in its very infancy, and was prone to subjective interpretation, regional bias and outright foolishness. Golf science had years of trial and error to go before reaching an objective standard. It was in these early years that the "Magic Move" was first identified. For decades, this misunderstood and antiquated theory has been the downfall of many hard-working golfers. Let's set the record straight. The one move that countless students and teachers identify as the singular trait of all great golfers is known as the "Snead Squat." As Snead's club reached the peak of the backswing, his hips stopped turning back and initiated their forward reaction. Immediately following this, he and other great players of his day appeared to sit down, or drop their backsides toward the ground. Their knees often bowed out and away from each other, and the players appeared to squat into a totally stable base from which to accelerate the club to the ball. Sounds simple and true, right? It's not. Amateur golfers have wasted lifetimes trying to squat their way out of slicing, topping and hooking the ball. Taking their cues from years of erroneous methodology, good players made themselves into worse players by committing the cardinal sin of intentionally decelerating on their downswings, emulating an isolated habit of great ball strikers. This is an unnecessary catastrophe which we can fix here and now. The Magic Move, the one that initiates all great ball-striking, is the first move from the top of the backswing. Prior to the squat even taking place (if it does at all), all great golf shots are made or lost. The downswing must be a natural reaction to the coil of the swing, and not a snatching motion or a rush to hit at the ball. As Nick Faldo wrote in his book "A Swing For Life," even the best pre-shot routine and swing mechanics cannot overcome a swing that is rushed from the top. The squat was misidentified as being the legitimate Magic Move because it was often the move directly following the real Magic Move, which is the deliberate change of direction from the top of the swing. 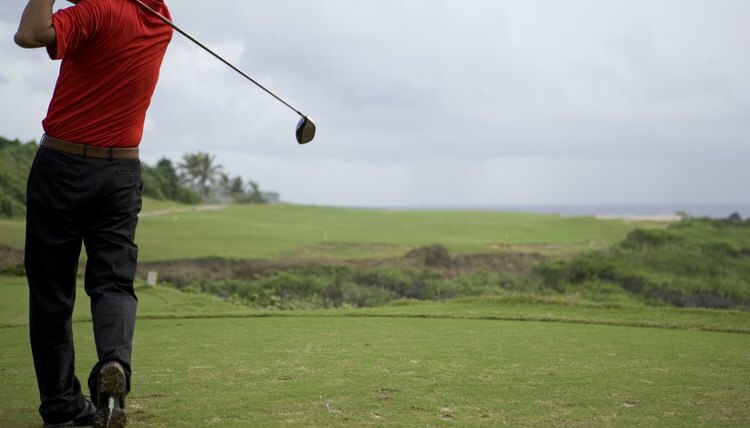 Think of the golf swing as the equivalent to throwing a ball. Now imagine what would happen if you tried to throw a ball before your arm reached the end of its backward motion. It's not possible. You'd jettison it into a random direction. This is precisely what occurs when a golfer does not take the time to let the laws of inertia redirect their physical energy in a pendulum motion. Newtonian laws do not take into consideration birdies and bogeys, and will not change simply because we desire one and fear the other. Only by the natural turning away from, and then turning back toward the target, will any kind of throwing or swinging motion achieve both power and accuracy. Once you learn to coil and uncoil naturally, you will feel the ball fly off the club face. Golf instructors call this "effortless power," and it is the staple of PGA Tour greats. Start letting the club work for you, and stop trying to contort into a squatting position at high speeds. Once you stop squatting and begin gradually building speed from the top, you will replace a weak slap at the ball with a smooth release through it. So now that you don't have to mimic a crazy squatting motion on your downswing, you can start moving fluidly and athletically. Your body will thank you for it, you will improve faster and you will enjoy golf that much more. Spend time practicing a natural pendulum motion with your favorite club and you will become a much better striker of the ball. With more than 30 years of golf experience and a comprehensive love for the game, Scott Camp brings an advanced structural knowledge of the swing and of the components of modern golf to his writing. His goal is to bring both the game of golf and its traditions to people worldwide.